This could allow neurologists to predict what the patient's neuroanatomic and associated cognitive state will be at any given point in the future. They could tell whether and when the patient will develop speech impediments, memory loss, and behavioral peculiarities. This is interesting and fascinating medical science. First and foremost, if used effectively this computer model could help predict how the various dementia(s) spread throughout the brain: and accurately predict a type of dementia (Alzheimer's, Frontotemporal, Lewy body, etc). If you are like most Alzheimer's caregivers, or like me, you have probably wondered how the disease is going to progress and at what rate. How fast, how slow. This computer model, along with new magnetic resonance imaging research (MRI, fMRI), and the identification of biomarkers, could allow doctors not only to predict the course of dementia; but also, determine whether a specific treatment is working. Imagine being able to predict how the brain, the neural network, is going to change over time. This would give caregivers insight into how behavior and communication are likely to change. This would allow scientists in clinical trials to determine whether a potential therapy is working, and if a specific target is being affected. If scientists are able to predict patterns, how dementia spreads throughout the brain, and then change those patterns, delay those patterns, or stop those patterns we should be moving closer to an effective treatment. Instead of throwing darts at a dartboard from a distance, scientist might be able to stick pins right into specific areas of the dartboard and get to work. Researchers at Weill Cornell Medical College have developed a computer program that has tracked the manner in which different forms of dementia spread within a human brain. They say their mathematic model can be used to predict where and approximately when an individual patient's brain will suffer from the spread, neuron to neuron, of "prion-like" toxic proteins — a process they say underlies all forms of dementia. Their findings, published in the March 22 issue of Neuron, could help patients and their families confirm a diagnosis of dementia and prepare in advance for future cognitive declines over time. In the future — in an era where targeted drugs against dementia exist — the program might also help physicians identify suitable brain targets for therapeutic intervention, says the study's lead researcher, Ashish Raj, Ph.D., an assistant professor of computer science in radiology at Weill Cornell Medical College. "Think of it as a weather radar system, which shows you a video of weather patterns in your area over the next 48 hours," says Dr. Raj. "Our model, when applied to the baseline magnetic resonance imaging scan of an individual brain, can similarly produce a future map of degeneration in that person over the next few years or decades. "This could allow neurologists to predict what the patient's neuroanatomic and associated cognitive state will be at any given point in the future. They could tell whether and when the patient will develop speech impediments, memory loss, behavioral peculiarities, and so on," he says. "Knowledge of what the future holds will allow patients to make informed choices regarding their lifestyle and therapeutic interventions. "At some point we will gain the ability to target and improve the health of specific brain regions and nerve fiber tracts," Dr. Raj says. "At that point, a good prediction of a subject's future anatomic state can help identify promising target regions for this intervention. Early detection will be key to preventing and managing dementia." The computational model, which Dr. Raj developed, is the latest, and one of the most significant, validations of the idea that dementia is caused by proteins that spread through the brain along networks of neurons. It extends findings that were widely reported in February that Alzheimer's disease starts in a particular brain region, but spreads further via misfolded, toxic "tau" proteins. Those studies, by researchers at Columbia University Medical Center and Massachusetts General Hospital, were conducted in mouse models and focused only on Alzheimer's disease. In this study, Dr. Raj details how he developed the mathematical model of the flow of toxic proteins, and then demonstrates that it correctly predicted the patterns of degeneration that results in a number of different forms of dementia. He says his model is predicated on the recent understanding that all known forms of dementia are accompanied by, and likely caused by, abnormal or "misfolded" proteins. Proteins have a defined shape, depending on their specific function — but proteins that become misshapen can produce unwanted toxic effects. One example is tau, which is found in a misfolded state in the brains of both Alzheimer's patients and patients with frontal temporal dementia (FTD). Other proteins, such as TDP43 and ubiquitin, are also found in FTD, and alpha synuclein is found in Parkinson's disease. These proteins are called "prion-like" because misfolded, or diseased, proteins induce the misfolding of other proteins they touch down a specific neuronal pathway. Prion diseases (such as mad cow disease) that involve transmission of misfolded proteins are thought to be infectious between people. "There is no evidence that Alzheimer's or other dementias are contagious in that way, which is why their transmission is called prion-like." Dr. Raj calls his model of trans-neuronal spread of misfolded proteins "very simple." It models the same process by which any gas diffuses in air, except that in the case of dementias the diffusion process occurs along connected neural fiber tracts in the brain. "This is a common process by which any disease-causing protein can result in a variety of dementias," he says. The model identifies the neural sub-networks in the brain into which misfolded proteins will collect before moving on to other brain areas that are connected by networks of neurons. In the process the proteins alter normal functioning of all brain areas they visit. 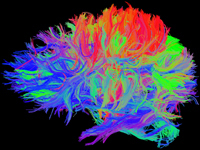 "What is new and really quite remarkable is the network diffusion model itself, which acts on the normal brain connectivity network and manages to reproduce many known aspects of whole brain disease patterns in dementias," Dr. Raj says. "This provides a very simple explanation for why different dementias appear to target specific areas of the brain." In the study, he was able to match patterns from the diffusion model, which traced protein disbursal in a healthy brain, to the patterns of brain atrophy observed in patients with either Alzheimer's disease or FTD. This degeneration was measured using MRI and other tools that could quantify the amount of brain volume loss experienced in each region of the patient's brain. Co-author Amy Kuceyeski, Ph.D., a postdoctoral fellow who works with Dr. Raj, helped analyze brain volume measurements in the diseased brains. "Our study demonstrates that such a spreading mechanism leads directly to the observed patterns of atrophy one sees in various dementias," Dr. Raj says. "While the classic patterns of dementia are well known, this is the first model to relate brain network properties to the patterns and explain them in a deterministic and predictive manner." The study's third contributing author is Michael Weiner, M.D., professor of radiology at the University of California at San Francisco, and the principal investigator of the Alzheimer's Disease Neuroimaging Initiative, funded by the National Institutes of Health. The study was funded by the National Institutes of Health. None of the authors have any competing financial interest to disclose. Weill Cornell Medical College, Cornell University's medical school located in New York City, is committed to excellence in research, teaching, patient care and the advancement of the art and science of medicine, locally, nationally and globally. Weill Cornell Medical College is affiliated with NewYork-Presbyterian Hospital, where its faculty provides comprehensive patient care at NewYork-Presbyterian Hospital/Weill Cornell Medical Center. The Medical College is also affiliated with the Methodist Hospital in Houston. For more information, visit weill.cornell.edu.